We're pleased to announce that the Foundation is partnering with Pyro Novelties in 2018 to include our Celebrate Safely safety tips on the shopping bags they stock. Pyro Novelties has retailers from across the country who purchase their bags and they print approximately 500,000 each year. The bags come in two sizes and have a red & blue patriotic theme. 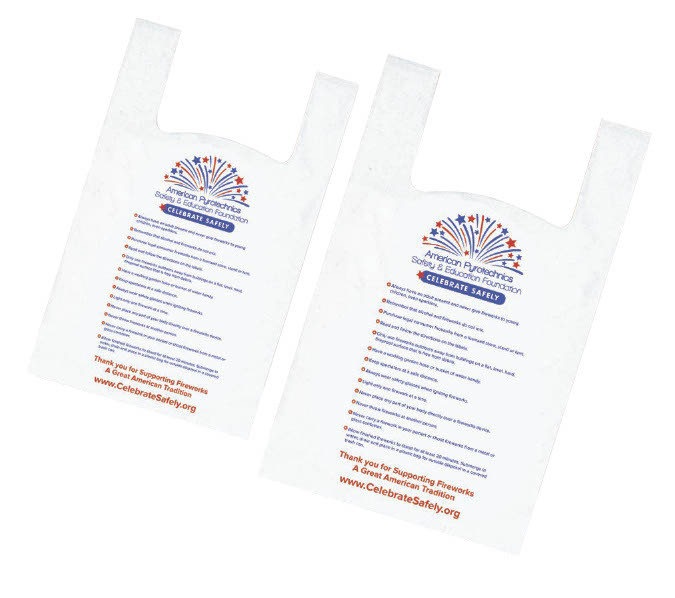 Pyro Novelties has generously offered to make a $1 donation to the Foundation for every case of shopping bags sold. The wholesale price on the bags will be $34.99 per case with free shipping for the purchase of 30 or more cases (up to 10% of the order total). An additional 5% discount ($33.25 a case) will be given to larger orders (75 or more cases) plus free freight up to 10% of their order total. Special "pre-order" pricing is available at a 10% discount until January 26th for orders of 10+ cases of bags at $31.50 per case. If you're interested please contact Katherine Guccione at [email protected] for details. We thank Katherine for this support of the Foundation and urge you to consider this option when purchasing your retail shopping bags. The APA's Safety & Education Foundation is the only industry organization educating youth and the general public about fireworks and their safe use. The Foundation has very limited overhead expenses and the vast majority of funds are spent to develop resources to support its outreach programs. We have some great ideas for 2018, but need your support to make them a reality. Please consider becoming a logo sponsor and add your company logo to the Foundation website www.celebratesafely.org click here for a donation form - those responding by Wednesday January 24 will be recognized on special signage at the APA Winter Conference. ¿ Continuing efforts to cultivate relationships within the CPSC public affairs office and seek opportunities to provide input to their July 4th messaging including expansion of our #celebratesafely theme and prominence on the CPSC website. ¿ Expanding partnerships with the National Afterschool Association to broaden distribution of our educational curriculum. ¿ Create career resources to assist educators and youth on how they can become pyrotechnicians. ¿ Cultivating a relationship with the National Association of School Nurses to provide education on injury prevention. ¿ Broadening recognition of the Foundation within the fireworks industry. Join the Foundation Fun in Las Vegas at Losers Most Wanted Bar! The APA Winter Conference is just a few weeks away and if you are attending, make sure to reserve time after dinner on Wednesday, February 7 to have fun with your APA friends and raise some dollars to support the APA's Safety and Education Foundation. The party is at Losers Most Wanted Bar inside the MGM complex and it will be hosted by Phantom Fireworks. They are requesting that in lieu of purchasing a ticket, that party attendees make a $20 contribution (cash or check) at the door - all proceeds going to benefit the Foundation! 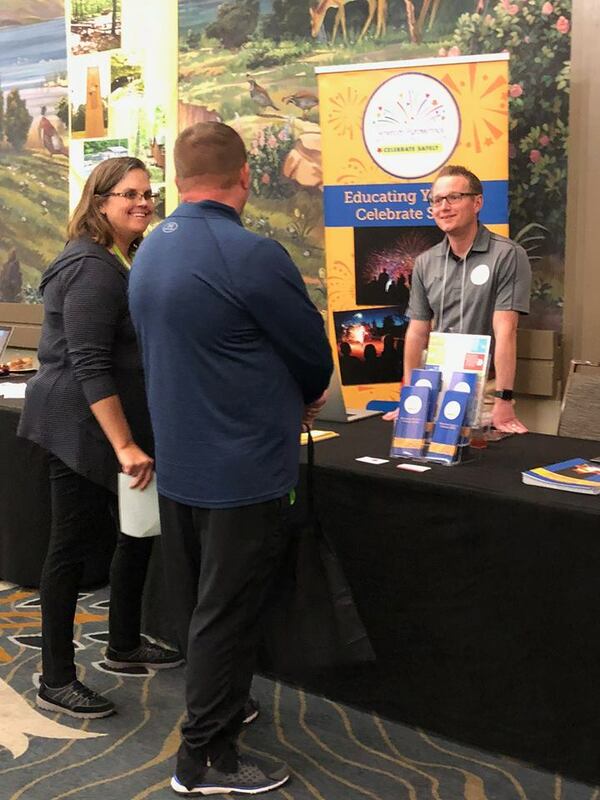 This past December, Foundation President Michael Ingram, Fireworks Over America, exhibited at the Missouri Coordinated School Health Coalition Conference where he met with educators to promote the Foundation's educational curriculum, videos, and other resources. 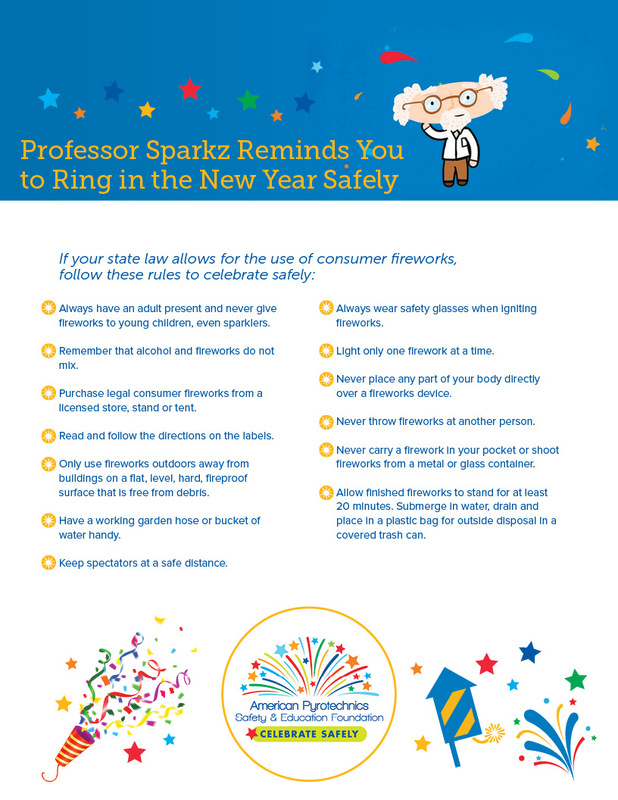 To remind the general public to #celebratesafely a special New Year's Eve safety tips flyer featuring Professor Sparkz was created and shared via press release and thru social media in the days prior to the holiday. 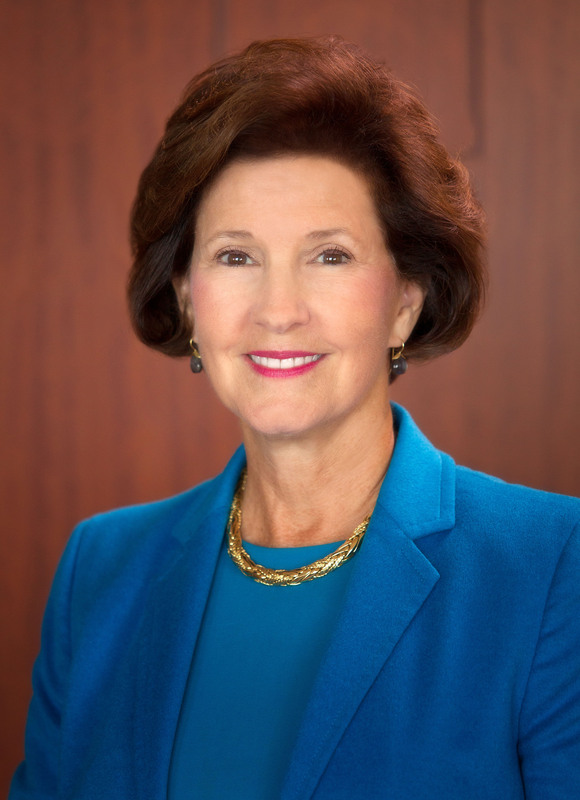 The former Chair of the CPSC Inez Tenenbaum will continue to assist the Foundation in getting its fireworks safety and education message distributed across the country. We are very fortunate to have someone with her expertise and stature as an advocate; she is highly repected among educational organizations and personnel within the CPSC.